Amalfi private tour - Travel from Rome along the "Highway of the Sun" and after passing Mt.Vesuvius volcano which destroyed Pompeii in 79 a.d. ascend a scenic road that crosses the mighty jagged Lattari Mountains and little towns specialized in the production buffaloes-milk mozzarella and arrive in Ravello .An incomparable and celebrated eagle-nest town frequently visited by Europe's 19th century nobility during the Grand Tour and artists like Richard Wagner who composed his "Garden of Klingsor". The Amalfi private tour continues after having visited the Moorished-styled garden of Villa Rufolo dating from the 11th century. The Villa , also mentioned by Boccaccio in his "Decamerone", is an enchanted oasis of prodigious plants and flowers laid out on inebriating terraces overlooking the awesome cliffs high above Amalfi. 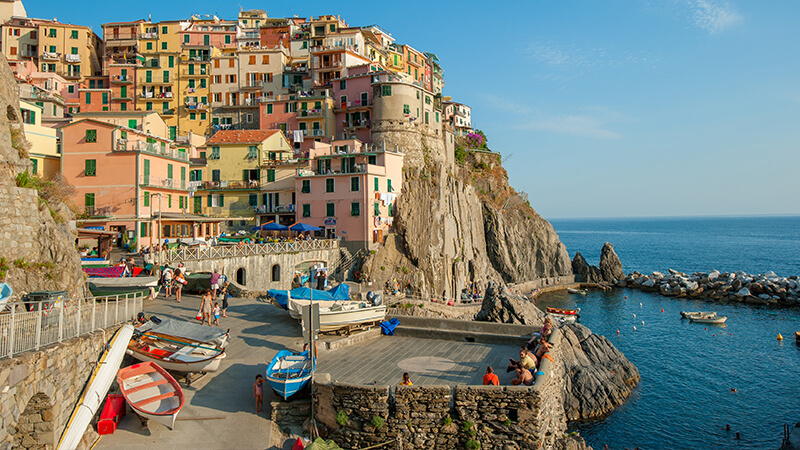 Visit also Villa Cimbron, built over ruins of a roman villa, to admire the superb coastline and to try spot Gore Vidal's retreat clinging to the craggy lime cliffs where myriad terraces of lemon groves degrade steeply to sea level. 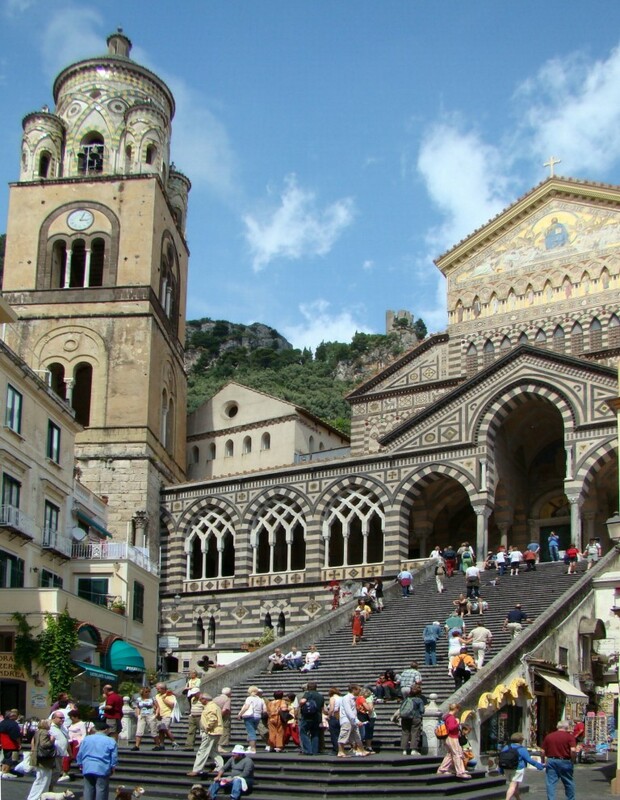 Descend a spectacular road to Amalfi, oldest of the four medieval sea-republics of Italy, and where Flavio Gioia invented the navigation compass and where the first maritime laws were established. The town became wealthy through the close commercial ties with the orient and Sicily. Visit the cathedral of St. Andrew that holds the remains of the Apostle; its oriental façade enclose a lombard-romanique interior and bronze doors fused in Constantinople in 1067. Henry Longfellow re-evocated in his poetry dedicated to Amalfi the incredible beauty of the surroundings and John Ruskin many water-colours capturing views of the city. Continuing the Amalfi private tour driving along the savage beauty of the coast bathed by brilliant sunlight and the amazing vertical bluffs of vivacious colours and deep fjords of scintillating blue waters forming the coast road made up of 1000 bends with villages of cluster homes clinging to the mountains and between the sky and sea. See the distant island of Capri and arrive in Positano, a fishermen town of flights of steps and narrow arched passageways, enlivened by summer casual fashions much appreciated by the cosmopolitan clientele. Positano is a vertical village with countless terraced lemon, fruit and flowered gardens and cubic domed pastel houses beneficially exposed to the sea breeze degrading down to the beach protected by Saracen watch tower, remnants of past dramatic incursions of Saracens and Turks. After time to browse and enjoy the exotic atmosphere continue and reach the panorama points of Sorrento to admire its perched situation on high cliffs of tufa stone with wonderful views of the Bay of Naples and Mt.Vesuvius and enjoying the Sorrentine Coast with its unforgettable vistas reach the "Highway of the Sun" and return to Rome. End of Amalfi private tour. Prezzi per persona, incluso il trasporto con Limousine o minivan con aria condizionata e tasse. La Limousine contiene fino a 4 passeggeri più l’autista. Per più di 4 passeggeri verrà usato il minivan.